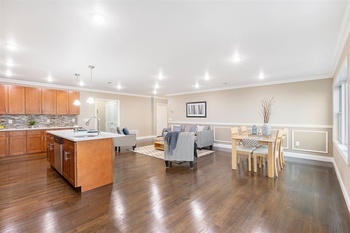 Gorgeous 3 bedroom completely renovated condo includes hardwood floors throughout, central air, spacious living room, dining room and washer/dryer in unit. Enjoy your meals in this gourmet kitchen with plenty of lighting and brand new appliances. Conveniently located near public transportation, schools and shopping. Never have to worry about parking or storage, this property comes with a two car garage that also has plenty of storage space. Don't let some else take this perfect property!! !